Not only are these strawberries cute they are delicious. That is if you can bring yourself to eat them. As for me… that’s not a problem. I LOVE chocolate covered strawberries! 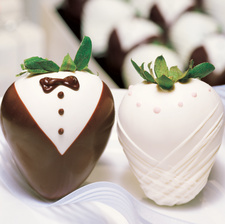 What better way to spice up a reception and add some fun than with these berries. They are super and they are making me hungry just looking at them. YUM!!!! Learn More! ooohh!! super muper cute indeed!! yummy!